Venezuela has joined the South American trade bloc Mercosur in a move that has split observers over whether it will help or hinder the group. President Hugo Chavez said Venezuela's "road to liberation" lay with Mercosur and called the expansion "historic". Mercosur was set up in 1991 and its four current members are Brazil, Argentina, Uruguay and Paraguay. Some critics have said that Venezuela's membership will hurt its economy and increase tensions within Mercosur. Venezuela was welcomed into the organisation at a summit in the country's capital Caracas. The expanded group will now cover about 250 million people and account for close to 75% of South America's total gross domestic product (GDP). The move has sparked concern among some Venezuelan business people, who fear that by opening its markets to other Mercosur nations, many of Venezuela's companies and producers may be forced out of business by bigger and better-run rivals. 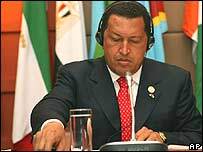 There also are concerns that Mr Chavez will try to use the group to promote his brand of politics and economic development that has often seen him clashing with the US over the amount of influence it has in the region. Some commentators see a tug of war developing between the Mercosur members that prefer a more liberal, open-market approach, and those that want the state to have a powerful, guiding role in the direction of a nation's economy. Venezuela's government "has made a decision in which geopolitical criteria have prevailed over economic criteria", said Jose Luis Betancourt, president of the Venezuelan business group Fedecamaras. Under the terms of the agreement, Venezuela will immediately get rid of tariffs on imports from Paraguay and Uruguay, and will do the same to goods from Brazil and Argentina in 2014. In the meantime, tariffs will vary but are expected to average at about 12%, government officials said. However, Mercosur has had its own share of problems as nations have clashed over the amount of access they have been granted to each other's markets. "Venezuela is going to join an aspiring common market that is dead on arrival. Mercosur has struggled to lay the foundations for an effective trading bloc," said Patrick Esteruelas, an analyst at Eurasia Group. Paraguay's President Nicanor Duarte Frutos said that Mercosur still faced a lot of obstacles. "We must develop more open commerce and not just make statements about regional integration that don't always coincide with what is practised," he said.